A new channel has started in DVB-S Clear: Al Jazeera Documentary (Qatar) on 10971.00MHz, pol.H SR:27500 FEC:5/6 SID:404 PID:517/700. A new channel has started in DVB-S Clear: Al Jazeera Documentary (Qatar) on 12558.00MHz, pol.V SR:27500 FEC:3/4 SID:9355 PID:240/241. 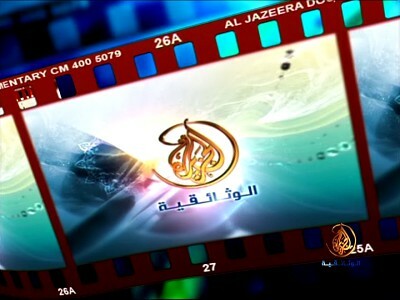 New frequency for Al Jazeera Documentary: 11045.00MHz, pol.H (DVB-S SR:27500 FEC:3/4 SID:6 PID:517/700 Arabic- Clear). Al Jazeera Documentary switched to Nilesat 201 satellite at 12054.00MHz, pol.V (DVB-S , 12054.00MHz, pol.V SR:27500 FEC:5/6 PID:2000/2001 Arabic). New SID for Al Jazeera Documentary on 11045.00MHz, pol.H FEC:3/4 SR:27500: SID:6 ( PID:517/700 Arabic - Clear). New SID for Al Jazeera Documentary on 11045.00MHz, pol.H FEC:3/4 SR:27500: SID:10504 ( PID:517/700 Arabic - Clear). New PID for Al Jazeera Documentary: PID:1291/1292 Arabic SID:2514 (11919.00MHz, pol.H SR:27500 FEC:5/6 - Clear). New frequency for Al Jazeera Documentary: 12054.00MHz, pol.V (DVB-S SR:27500 FEC:5/6 SID:2217 PID:2000/2001 Arabic- Clear). Al Jazeera Documentary (Qatar) broadcasts in DVB-S Clear on 11045.00MHz, pol.H SR:27500 FEC:3/4 SID:6 PID:517/700 Arabic. New frequency for Al Jazeera Documentary: 10992.00MHz, pol.V (DVB-S SR:27500 FEC:3/4 SID:6 PID:517/700 Arabic- Clear). New PID for Al Jazeera Documentary: PID:133/1292 Arabic SID:2514 (11919.00MHz, pol.H SR:27500 FEC:5/6 - Clear). A new channel has started in DVB-S Clear: Al Jazeera Documentary (Qatar) on 11604.00MHz, pol.H SR:27500 FEC:3/4 SID:10504 PID:517/700 Arabic. New PID for Al Jazeera Documentary: PID:2017/2019 Arabic SID:5706 (10853.44MHz, pol.H SR:27500 FEC:3/4 - Clear). Al Jazeera Documentary is back on 10853.44MHz, pol.H SR:27500 FEC:3/4 SID:5706 after a break ( PID:2018/2019 Arabic - Clear). A new channel has started in DVB-S Clear: Al Jazeera Documentary (Qatar) on 4054.00MHz, pol.L SR:27500 FEC:3/4 SID:6 PID:517/700 Arabic. Al Jazeera Documentary is back on 11564.49MHz, pol.H SR:27500 FEC:3/4 SID:6206 after a break ( PID:2018/2019 Arabic - Clear). New frequency for Al Jazeera Documentary: 11449.41MHz, pol.H (DVB-S SR:27500 FEC:5/6 SID:6314 PID:1291/1292 Arabic- Clear). New frequency for Al Jazeera Documentary: 11564.49MHz, pol.H (DVB-S SR:27500 FEC:3/4 SID:6206 PID:2018/2019 Arabic- Clear). A new channel has started in DVB-S Clear: Al Jazeera Documentary (Qatar) on 4054.00MHz, pol.L SR:27500 FEC:3/4 SID:5 PID:517/700 Arabic. Al Jazeera Documentary switched to Eutelsat 7 West A satellite at 10853.00MHz, pol.H (DVB-S , 10853.00MHz, pol.H SR:27500 FEC:3/4 PID:2018/2019 Arabic). Al Jazeera Documentary switched to Eutelsat 7 West A satellite at 11034.00MHz, pol.V (DVB-S , 11034.00MHz, pol.V SR:27500 FEC:3/4 PID:2018/2019 Arabic). A new channel has started in DVB-S Clear: Al Jazeera Documentary (Qatar) on 11178.00MHz, pol.H SR:27500 FEC:3/4 SID:6 PID:517/700 Arabic. New frequency for Al Jazeera Documentary: 10809.00MHz, pol.V (DVB-S SR:27500 FEC:3/4 SID:6 PID:517/700 Arabic- Clear). A new channel has started in DVB-S Clear: Al Jazeera Documentary (Qatar) on 4136.00MHz, pol.L SR:27500 FEC:3/4 SID:5 PID:517/700 Arabic. New frequency for Al Jazeera Documentary: 11919.00MHz, pol.H (DVB-S SR:27500 FEC:5/6 SID:2514 PID:1291/1292 Arabic- Clear). Al Jazeera Documentary (Qatar) broadcasts in DVB-S Clear on 12360.42MHz, pol.H SR:27500 FEC:3/4 SID:3003 PID:2007/2008 Arabic. Al Jazeera Documentary switched to Atlantic Bird 4A satellite at 10719.00MHz, pol.V (DVB-S , 10719.00MHz, pol.V SR:27500 FEC:3/4 PID:517/700 Arabic). New frequency for Al Jazeera Documentary: 4120.00MHz, pol.V (DVB-S SR:27500 FEC:3/4 SID:6 PID:517/700 Arabic- Clear). Al Jazeera Documentary (Qatar) broadcasts in DVB-S Clear on 10719.00MHz, pol.V SR:27500 FEC:3/4 SID:3909 PID:517/700 Arabic. New frequency for Al Jazeera Documentary: 12034.00MHz, pol.H (DVB-S SR:27500 FEC:3/4 SID:6 PID:517/700 Arabic- Clear). A new channel has started in DVB-S Clear: Al Jazeera Documentary (Qatar) on 12284.00MHz, pol.V SR:27500 FEC:3/4 SID:2706 PID:517/700 Arabic. A new channel has started in DVB-S Clear: Al Jazeera Documentary (Qatar) on 12111.00MHz, pol.V SR:27500 FEC:3/4 SID:705 PID:240/241 Arabic. A new channel has started in DVB-S Clear: Al Jazeera Documentary (Qatar) on 10971.00MHz, pol.H SR:27500 FEC:3/4 SID:6 PID:517/700 Arabic. Al Jazeera Documentary is testing in DVB-S Clear on 12111.00MHz, pol.V SR:27500 FEC:3/4 SID:705 PID:240/241 Arabic. Al Jazeera Documentary is testing in DVB-S Clear on 12284.00MHz, pol.V SR:27500 FEC:3/4 SID:2706 PID:517/700 Arabic.